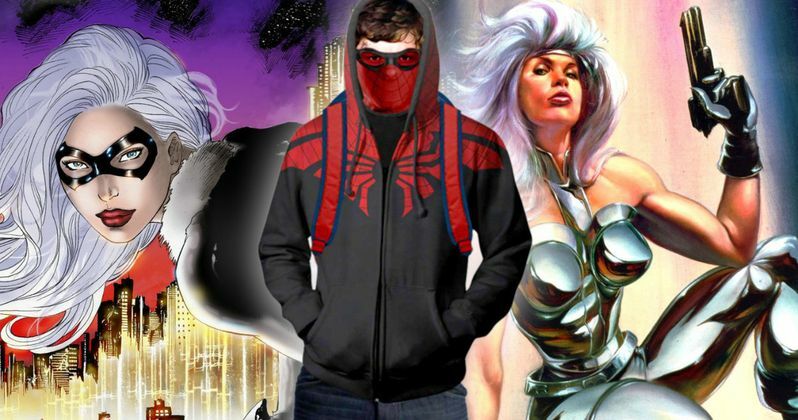 The last we heard about Sony's superhero spin-off Silver and Black was that it was set to take place in the Spider-Man: Homecoming universe, meaning there is a chance that Tom Holland's Peter Parker/Spider-Man could show up in the movie. While that has yet to be confirmed, another report surfaced today, that shed some new light on how Silver Sablinova and Felicia Hardy first cross paths. In the comics, Felicia Hardy is a master thief, a skill of hers which helps set the story in motion, if this new report is to be believed. This unconfirmed report comes from That Hashtag Show, which reveals that the story is put in motion because Black Cat steals from the wrong people, which puts her on everyone's radar, including Silver Sable. This report goes onto claims that Silver Sable is most definitely the protagonist of the film, and that her father also has a big role. Here's an excerpt from That Hashtag Show's report below, which also reveals who the main villain will be. "Though the pair shares the title of the film, Sable is unquestionably the film's protagonist. Her father, Ernst, and her Symkarian people play a major role in the events of the film and drive her personal vendetta against the film's main villain, Mendel Stromm. No spoilers here, but Stromm's experimentation on the Symkarian people and dealings with her father have left a very, very bad taste in her mouth and she is absolutely out for vengeance. While she is ostensibly brought into the film to chase down Felicia Hardy, she does so because she believes it will put her into contact with Stromm." There was also a report from June that claimed this movie would help set up an all-female Spider-Man universe, and that by the end of the film, Silver Sable and Black Cat will be leading a team that includes Jessica Drew (Spider-Woman), Charlotte Witter (Stunner), Sarah Ehret (Jackpot) and Cassie St. Commons (Dusk). Naturally, that report hasn't been confirmed either, especially since it's only been just over four months since Christopher Yost was brought in to write the screenplay. At the beginning of this story, Silver Sable is said to be a bounty hunter working for the U.S. Department of Justice, leading a team that includes Dominic Fortune, Mark Sim, Doug Powell and Lorna Kleinfeldt, but those details haven't been confirmed either. Here's another excerpt from the report, revealing what Black Cat steals that gets her into so much trouble. "Hardy, as we mentioned, as everyone out to get her because she's been taking things that don't belong to her using what's being described as an "enhancement" by Stromm. It'll be interesting to see just what those enhancements are and how, if at all, they tie into her good luck "powers" she's traditionally had in the comics. Now that she's on the run, Stromm and those that fund his work, want her back. To that end, Stromm sends Tarantula and Scorpion for her only to find she's already been caught by Silver Sable. Her business with Hardy is just business, but through it she means to settle the score with Stromm and she has no compulsions about dragging the Black Cat into her fight." We reported in May that Gina Pryce-Blythewood has signed on to direct from Christopher Yost's script, with the studio setting an October 18, 2018 release date. The production is reportedly seeking actresses in their mid-twenties for these roles, with the actresses who sign on likely coming aboard for multi-picture deals. Still, there is no indication that the casting process has even begun yet or if the studio is eyeing any particular actresses for Silver and Black at this time. Still, with the October 18, 2018 release date looming, we may start hear about more casting details soon. Spider-Man Spin-Off Silver and Black to Become 2 Separate Movies? Silver Sable and Black Cat Movie Shoots in Mexico This Spring? Marvel's Wild Pack to Be Unleashed in Silver and Black?